Ever since the Communists withdrew their support to the UPA government over Nuclear deal, the Left has received more than it’s share of criticism. They aren’t given due credit for their role in keeping Congress government in check over the liberalization but are accused of wielding power without responsibility. However, the positive aspects of the impact of CPI (M)-CPI in the earlier government have been forgotten. In fact, left-bashing is a favourite exercise among several sections. Left may have suffered a drubbing in the polls and Prakash Karat may seem arrogant but at the same time, they shouldn’t be condemned just for the heck of it. Ironically, it seems a fashion to find faults with the Leftists without realizing that they did play an important part in the early years of coalition, in saving Indian economy that might have collapsed during the global financial crisis. Pandit Ji has made a lot of other valid observations. It’s true that Left is unable to market itself and it has it’s own problems but the Congress must learn its lessons well. However, it was shocking to see a couple of newspapers that are also reeling under the impact of meltdown, lobbying for Montek Singh Ahluwalia to be the Finance Minister. Ahluwalia may be a brilliant person and an economist but his World Bank vision couldn’t have saved India. What we need is reforms with a humane face and pro-people policies. Pampering India Inc alone won’t work in this nation where hundreds of millions are still below poverty line. I was most relieved after the oath taking ceremony. Pranab Mukherjee has lately travelled far and wide in his constituency Jangipur and saved lakhs of bidi workers' jobs. Prime Minister Manmohan Singh and Sonia Gandhi seems to have realized that what works in US doesn’t exactly work the same way in India. Blame Lalu Prasad Yadav for all the ills that plague Bihar. But imagine what would have happened in this poor country had the railway been privatised and sold, which was almost becoming a reality before Lalu. In this poor country it would have dealt a huge blow to 75% of population. Left was dead against it. And those who are aware of the great Indian railways works, it is well-known that only a state-run organisation can keep it going. The huge workforce that is responsible for safety of millions of passengers every day, is no joke. The chain of command, responsibility and the unique hierarchy is only possible in the government-run behemoth. However, Congress shouldn’t get arrogant after the landslide victory and must keep in mind that left and its allies have had a role in policies that led to its victory. Go to any village and you will find that every villager talks about job cards. They may not get the entire wage. But yes, NREGS, has made a difference. It is one of the most unique schemes in the world and may be it brought a turnaround. Congress should try to be more pro-people. It shouldn't forget that it was basically the pressure of Left that led to the implementation of NREGS, the RTI or the Tribal Forests Right Act and other pro-people schemes. But does BJP have any plan to think for the welfare of the common man? If they really want to fight the Congress, they must devise a work plan and start from the grassroots to ensure that the citizens get benefited—either in the form of employment, health, financial security or other basic needs. What about a strong anti-corruption and anti-bribe campaign? BJP does have millions of workers and sympathisers and if it launches such a drive, that will help it and the citizens equally. 1. 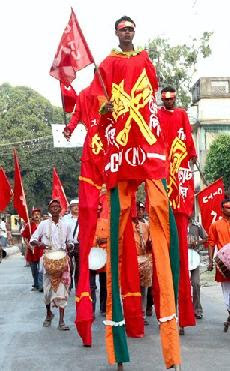 Nine persons were brutally killed because of being outsiders and Hindi speakers. They were abducted, taken away blindfold and then murdered. This incident didn't take place in Swat but in our own country barely over a week ago. Wasn't it shocking? Hindi speakers killed in Hindustan. But do you remember any such headline? All of them were migrants to Uttar Pradesh who had gone in search of work in Manipur. However, the news failed to find mention in the mainstream media that was busy in elections and IPL. Read the report. 2. Another massacre occurred soon after election, leaving no less than 16 persons including nearly half-a-dozen women police personnel dead. Once again these dead personnel were not termed martyrs and we don't even know the names of these young men and women who lost lives fighting the Naxalites in Gadchiroli in Maharashtra. Again it didn't get widely reported. Everybody was so entranced by the Congress victory. The newspapers and channels were wondering which faces would be inducted in cabinet and how much the allies will bargain for. THE BJP was too stunned to react. Even otherwise it doesn't react unless the killing organisation has a Muslim-sounding name. In the past incidents in which one person (or policeman) has been killed or even none, have been termed as terrorist acts and for days there are reports and followups on these organisations. 3. After Mumbai terrorist strike in November 2008 [26/11], Congress leaders had lost hopes of winning elections. But the Assembly polls in four states a few months later brought surprise victories to party in Rajasthan and Delhi. Still, they were privately praying that no more terrorist attacks should happen till elections, lest the public anger mounts against the Centre. However, it seems they were mistaken as nobody, neither Congress-BJP nor the public seem to care about terrorism. In the last couple of months there have been the most deadly militant strikes but none of them took place in urban India or the mainland India (North East, Chhattisgarh, Jharkhand, Gadhchiroli are all out of it). That's why BJP that loved to rake up terrorism also cares little when ten times more persons die in Naxalism. They do care that just one person died in Batla House encounter but 124 policemen have died this year alone in rest of India. Their selective definition of terrorism hasn't helped them. Naturally Indian public knew that mocking Gandhi family or Congress for weakness on terrorism was foolish. After all, nobody has paid a bigger price than Gandhis. Two generations--Indira and Rajiv have lost their lives to terrorism. How can they be soft on terrorism? They (the party and government) may be ineffective or inefficient but can't be soft. But it's time media also did a serious introspection of raising the bogey of Muslim terrorism. All terrorism is equally condemnable. BJP and Congress must understand that all forms of terror have to be dealt with sternly, in national interest. Neither Congress, nor BJP should play politics and must ensure that there are steps to quell militancy and terrorism. Now is time for a clear consensus on terrorism and efforts to deal with it. Though there has been a significant decline in representation of Muslims in this Lok Sabha election, Muslims don't seem to mind it, as the priority was to vote for suitable candidates irrespective of caste or religion. There has been nearly 20% downfall in number of Muslims elected to Lok Sabha in this elections compared to 2004. The figure is 29* out of 543. So Muslims will account for just 5% of MPs in the lower house of Parliament. However, it's good to see politicians with criminal background like Mukhtar Ansari, Rizwan Zahir and Taslimuddin out of the house. M Shahabuddin's wife contested from Siwan but lost. Clearly, Muslims largely voted for better candidates than Muslim contestants. And it's a good sign. An active parliamentarian who promises to solve basic problems of the area is many times better than a candidate of one's caste or community who may not do anything. Evidently, CPM heavy-weight Mohammad Salim was defeated from a Muslim-majority constituency. Or the other veteran Hannan Mollah who lost in West Bengal. In fact, after delimitation, it was felt that Muslims will win more seats because several constituencies that were earlier resrved for SCs and STs though had high minority concentration, had been de-reserved. But this didn't happen. So many candidates lost that one almost lost track. Shahid Siddiqui, Tariq Anwar, Rashid Masood, Noor Bano, CK Jaffer Sharief, AR Antulay, Maulana Maudood Madani, Salim Sherwani, Akbar Ahmad Dumpy, Dr Javed Akhtar, Afzal Ansari, Ilyas Azmi, Shahid Akhlaq, AA Fatimi et al. BJP's Mukhtar Abbas Naqvi also lost at the multi-cornered fight in Rampur where Jaya Prada won despite Azam's Khan sabotage attempt. AIMIM's Asaduddin Owaisi did retain Hyderabad seat by defeating Zahid Ali Khan, who managed to secure nearl 2 lakh votes. The new entrants include M Azharuddin and the young lady Mausam Benazir Noor from Malda. There won't be any veterans except Farooq Abdullah and a few other recognised faces like E Ahamed and Salman Khurshid. Perfume baron Badruddin Ajmal has entered Lok Sabha from Assam. In Uttar Pradesh, Muslims voted for Congress and SP while Mayawati's BSP didn't get adequate Muslim support. Except a few seats where Ulema Council and Peace Party candidates took away fraction of vote, mostly Muslims voted for non-Muslim candidates of clean-image. What else explains the victory of SP in 23 seats, though not a single Muslim has won on SP ticket. This is a very strange situation. SP couldn't have won so many seats without Muslim vote, as Yadav population is barely 10-12% in UP while Muslims form 18-19% of the electorate. Though it's tally has gone down, it remains the third biggest party in terms of seats in parliament after Congress and BJP. While BSP that has over 22% strong Dalit voter can win without Muslim support, SP can't win as many seats, unless it gets any other important community or section in its fold. Clearly, Muslims voted for Congress and SP. So when Muslims voted, they went for party and candidate, not the 'Muslim identity. 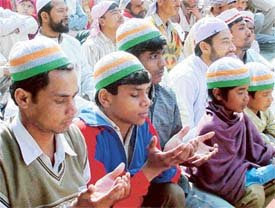 In some places where BSP put up Muslim candidates, the party got the votes of the community. But BSP's other candidates didn't get the support of community. Of the 29 Muslims elected to Lok Sabha, Congress has maximum winners from its ranks followed by National Conference and BSP (4 each), Muslim League and TMC (2 each), CPM, JDU, BJP, AIMIM, AUDF and DMK (1 each). 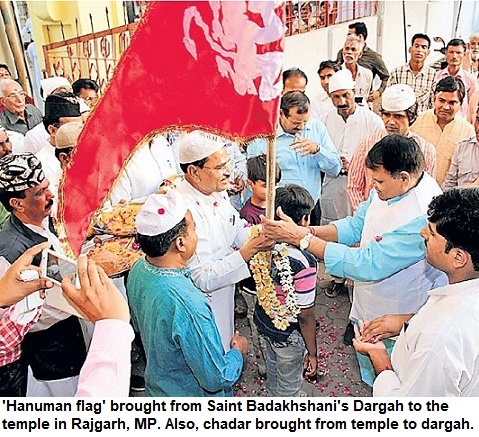 None of the Muslim candidates of RJD, SP or any other party could reach the Parliament. For those interested in statistics, the highest number of Muslims was elected to the Lok Sabha in 1980 when the figure was 48. In 1984 also, the number of Muslim MPs was 41. In the last election the figure was 36. UP (7), WB (6), Kashmir (4), Bihar (3), Kerala (3), Tamil Nadu (2), Assam (2), AP (1) and Laccadives (1). From Rajasthan, Madhya Pradesh, Karnataka and Jharkhand, no Muslim contestant emerged winner. The Congress' victory and its revival has surprised even the most optimistic party workers who till recently appeared unsure that they would be able to reach close to 190* seats. 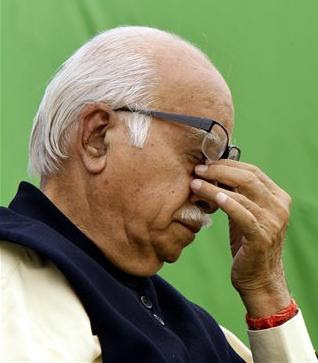 The 'weak' Manmohan Singh has knocked the 'Iron Man' LK Advani out of the electoral ring. Nobody had anticipated that the UPA would get the mandate once again, despite the anti-incumbency. Such was the propaganda machinery of BJP and failure of TV channels to notice any under current, that even the senior Congress leaders would say that they expect 150 plus seats. On the eve of counting Digvijay Singh, who had to speak optimistically, gave a figure of 170. In his heart he must have been thinking of 150 as a more pragmatic number. However, the party has seen a magical revival, especially in Uttar Pradesh. Not just rural India, the urban voters also rooted for the sober, down-to-earth Sardar and rejected the 'loud-mouthed' BJP leaders' who were always thundering and threatening. There is a word in Hindi-Urdu: Badbola. Perhaps, it is this 'badbolapan' which Indians don't like. After the failure of India shining, this is the second BJP defeat in successive elections. The 'Iron Man' failed to find favour among the electorate. The BJP's self-proclaimed toughness on terrorism didn't cut ice with the Indian voters. Perhaps, the histrionics didn't go down well. May be Indians do have a soft corner for the dynasty but it's not just Nehru-Gandhi family but the humility of Rahul Gandhi and Priyanka Gandhi that does strike a chord with the voters. Rahul's visits to Dalit hutments and decision to sleep in huts at night seems to have sent a message. Though BJP leaders then mocked at him, but he didn't reply in the same idiom. It is certainly a vote against Advani. The mild and soft-spoken Vajpayee was no longer on the scene. And voters were quite clear that they were exercising vote for the Parliament. That's why Congress had unexpected gains from across the country, even exceeding the most sympathetic opinion polls and exit polls. The predictions had failed to understand the mood of voters, who were just not ready to go for communal, divisive and emotive issues. Now there can be innumerable analyses like the success of NREGA (National Rural Guarantee Scheme) or Sonia Gandhi's charisma coupled with Rahul-Priyanka's charm who didn't aspire for any position just like their mother compared to octogenarian Advani's yearning for the post of PM and Narendra Modi's stake as next Prime Minister. Urban middle-class Indian may call it gimmick but for rural folk, it is something that matters. Meanwhile, Nitish Kumar's JDU, Navin Patnaik's BJD, Mamata Bannerjee's Trinamool Congress, Karunanidhi's DMK and Y Rajashekhar Reddy are among the other heroes of the election. 1. Left citadel crumbled. That's a lesson to arm-chair Communists like Prakash Karat who don't come from Trade Unionist background, but run party like private-owned company. Karat acted like a despot. 2. Most of the psephologists were claiming that the 'enigmatic' Mayawati's BSP was going to win over 40 seats (though I felt that she was not going to increase to her tally and had mentioned it) and she stands more or less at the same number she was in the last election. 3. Congress revival in the Hindustani heartland is astonishing. The Upper Castes who had voted for BSP in Assembly elections voted for Brahmin candidates of Congress. A section of Muslims too voted for Congress' Muslim candidates like M Azharuddin. 4. Yes, everybody expected RJD to perform badly but Ram Vilas Paswan's LJP's poor performance has been a real surprise. What happened to his committed voter? Development and comparative decline in crime during Nitish Kumar's regime split even the strong Dalit (and Muslim) vote of Paswan. 5. Urban areas including national capital Delhi and the financial capital Mumbai that was targeted by terrorists, snubbed BJP. This once again proves that Indians don't like loud war-mongering leaders. This is a setback for BJP. Do Indian elections matter to Pandit Ji and Aslam? Read any newspaper story or watch any news channel, the persons who are quoted and those who are referred to are mostly the upwardly mobile Indian. They include the software techie, the BPO guy, a businessman or an IIM graduate apart from celebrities. It is this particular section of urban class, which constitutes less than 5% of the population, that gets disproportionate attention. During election time, an exception is made. The farmers are also thought of and there are promises of waiving electricity bills or easy loans. However, there is a huge India aside. I spoke to Aslam and Pandit Ji, both groundnut sellers. Through out the day these two vendors carry the bag full of moong-phali along with a balance (tarazu) and move on selected routes, trying to earn some money by selling the groundnuts. For them sensex, income tax and foreign affairs are not major issues. 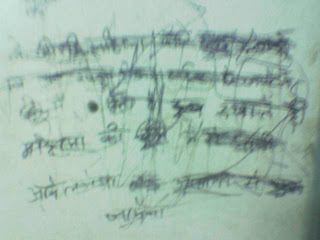 Pandit Ji's son passed XII but with 50% marks and he has no connections to get his son admission into any college. He can't afford private college fee. Besides, Pandit Ji has a severe infection in his foot but the government hospital turned him away. He has no money to go to a private hospital. He has a big family and has a hell lot of problems that seem to have no solution. Aslam has also his share of problems. "If I manage to sell groundnut worth Rs 150, then I save Rs 40-60 per day but that's not enough to meet my expenses". On bad days he makes Rs 30. He has a wife and a young kid. Wife makes carry bags out of newspapers and sells them at shops to get some money but it's hardly of any help. The tall promises of politicians in this election hardly matter to them. Aslam once went to a local corporator for relief after flood but eventually he got nothing. The irony is that nobody bothers about the poor any more or need for a real change. The most basic need is urgent and inexpensive medial care. However, it is no longer an issue. The middle-class stopped going to government hospitals and as a result nobody bothers about them. Poor go to government hospitals only to be told that the doctor hasn't come. If they are fortunate to get the doctor, there are no medicines. As the vocal middle-class has abandoned these places, nobody takes up these issues as newspapers and channels only listen to the class. In rural areas, situations are even worse. The second basic need is education. But the era when a poor guy studying in a government school could aim for the sky, is almost passe. Now you throw money and get a degree. Where is parity and equal opportunity? While MPs and MLAs raise their perks by thousands, millions of elderly citizens don't even get the minimal pension meant for destitute, that is barely a few hundreds a month. Pandit Ji and Aslam are just two persons who fall in a particular category of vendors. There are people who work as drivers for Rs 3,000 a month, those who works as private security guards for less than 2,500 (and those who work in garment shops and hotels, there are guys working as labourers, masons, coolies, repairers, signboard painters, waiters, mechanics and numerous such professions) who don't even hope for a raise of Rs 100-300 a year. There are teachers in private schools who don't get even 3,000 a month. And so many other people working in hundreds of other professions. A serious illness or an operation in a family is enough to give them a financial jolt for several years. Unfortunately this is not an issue in elections. The election has cost us Rs 10,000 crore. Mostly it's the rich who fight the election and such is the trend that an honest person who doesn't have either filthy money or party backing wouldn't even be able to introduce himself to more than a few thousand of electorate, let alone create an impact on the entire constituency of over 10 lakh to 20 lakh. After getting votes, they go back and the poor citizen doesn't even dare to knock at the doors of such palatial houses, even for genuine works. So what's positive about the election? Yes there is talk about development, but that's all hollow. What any person with a critical family member needs is urgent medical care at lesser cost, but no party and no candidate has even raised the issue of healthcare for all Indians. Not even the educated middle-class that should have set the agenda. We know we can afford better treatment and we don't care about the poor. Plain hypocrisy. We are worried about job losses but we don't care about millions of lives lost due to lack of medical attention. In rural India, more than 100,000 women die during pregnancy, just because of lack of proper health care. Though 90% of them are preventable. So what are the issues for the Lok Sabha polls 2009. Just think of it. What sort of election is that and what sort of people are we? Just a few days back the Indian Army convoy was attacked in Tamil Nadu by a group of Indian Tamil activists who had felt that the army trucks were on way to Sri Lanka to hand over arms and ammunition to help Sri Lankan army. It was unprecedented, as it happened on Indian soil. And despite the fact that LTTE is responsible for the assassination of our Prime Minister [Rajiv Gandhi] in the past. However, did you see any report or any editorial on this issue. Or anybody raising the issue of patriotism or extra-territorial loyalty even in blogosphere? Did anybody question it? Nobody denies the scale of human suffering in Sri Lanka where thousands are Tamils are caught in the Army's offensive against LTTE. Our heart goes out to them. But there were voices in support of LTTE and even Prabhakaran from our country and even protest against our military. is killing our soldiers ? classmates that 'you must be happy' and there were sacrcastic remarks. I didn't owe explanation to anybody. That was a turning point for me also. mentioned it at the blog Mohalla. You guys get such weird beliefs either due to hearsay or by watching some stupids. perhaps you would understand this pain. to try and understand us. Best of Luck. As the saying goes, Patriotism is the last refuge of the scoundrel. The patriotism test is, of course, meant solely for Indian Muslims, even though countless died in 1857 and later in the freedom struggle. Ashfaquallah got hanged but when a young BJP leader, Varun Gandhi, had the temerity to say that names like 'Karimullah, Mazharullah...' are scary, nobody asked such ungrateful souls about their patriotism. Isn't this man the traitor for daring to speak such abusive language. Mercifully, he didn't say Ashfaqullah in the same breath in the speech. Only an anti-national would find such a name scary. Would Ashfaqullah Khan's friends Rajendra Lahiri, Ram Prasad Bismil and Thakur Roshan Singh who also died with him, yearning for a free India, ever have dreamt that in independent India, leaders of a mainstream political party will shamelessly support and issue statements in favour of Varun Gandhi who finds names with 'Ullah' surname, 'scary'. However, no matter what qurbani [sacrifice] one gives for his nation, either it is Captain Hanifuddin or Havildar Abdul Hamid or Brigadier Usman, even their sons and family members would be suspect in the eyes of those who feel that they have the right to judge the patriotism of others just because they were not born in a family that follows their religion. So much propaganda has been made and falsehoods spread that many believe the lies like Muslims cheering for Pakistani cricket team. In England there was a similar 'Tebbit test' when first-generation Indians and Pakistanis were cheering for their teams against the English team, but tabloids that stirred up a debate and in a few months, it was forgotten. Why should we keep proclaiming our patriotism all the time! I am not going to repeat all the time that I am a patriot. Why should I? All the time Indian Muslims keep doing it, even going against Islamic teachings. Muslim cemeteries refuse to bury terrorists. The lawyer who fights the case is facing boycott from Shia community. The truth is that one has to live with this tragedy of deep hatred, mistrust and lies. I get so many hate mails and though I earlier got unsettled and it affected my personal life, I later got immune to them. I started moderating comments and now reject extremist comments, both anti-Muslim as well as anti-Hindu, or such comments that have abuses and obscenities. But sometimes there are comments that don't have any abusive language but are plane accusations. One feels that they deserve a reply. May be they were never told the truth. But the next day a new person will come to the blog and make another charge, without bothering to read the earlier post. That's why often I have contemplated that I should quit blogging and stay away from it. Anonymous persons are those who leave graffiti in train toilets. In real life they will be cool persons and often extremely civil, but will write worst things about women and girls, and derive some sort of pleasure from it. Similarly, blogosphere is a place where anyone can create an identity, and say things which he can't dare to ask me in real life. He doesn't need to put his photo with his comment. It is this plain hate that has brainwashed many youths. The recent bomb blast in a mosque in Beed in Maharashtra, that again didn't get reported adequately, is a signal. The three youths who were caught came from poor Marathi families. They told police that they couldn't bear the sight of a mosque in their town! That's why they planned to blew it up with a bomb. Is Babri Masjid demolition still an issue? Almost 17 years have elapsed since Babri Masjid was demolished but the mention of the mosque's demolition, brings back painful memories. 1. Electorally it remains an issue for different political parties as it serves their interests in various ways. When Lalu Prasad Yadav and Mulayam Singh Yadav recount the demolition of mosque, they want to embarrass the Congress. They also want to send the message to Muslims that they are the real secular warriors who had taken on the saffron juggernaut in the late 80s and early 90s. 2. Even BSP that hardly had any role in the Ayodhya movement, gets affected. The reaction of UP government to advertisement published in Urdu papers by an organisation [apparently on behalf of Samajwadi Party] was startling. The large size front page advertisement reminded Muslims that BSP [its leader late Kashi Ram] had long back suggested that toilet should be constructed at the disputed site. The advertisement asked, 'Will you vote for a party that has such vision?'. Stung by the ads the criminal cases were slapped on half-a-dozen Urdu papers of Uttar Pradesh for the 'offensive ads'. Urdu papers do get a few ads in electoral season but might have regreted publishing this particular one, as any cut in govertment ads can prove too costly for them. 3. Prime Minister Manmohan Singh said that Congress had no role in the destruction of Babri masjid, but he should know that the world knows how much Congress was responsible. Recently, a writer even mentioned PV Narsimharao as the first BJP Prime Minister of India. What a classic turnaround! But Kalyan has done it in the past also. When he first left the BJP to form RKP he had made similar charges. Then joined BJP and changed tone again. 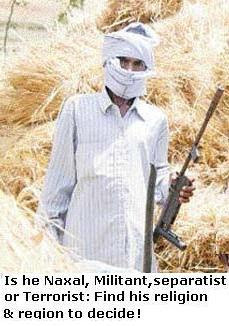 Now when he is once again in wilderness and has befriended Mulayam Singh, he speaks in another tune. 5. Interestingly, LK Advani who rode the chariot during his rath yatra and polarised the country on communal lines, calls it the saddest day of his life. Possibly, because the moment the sign of 'Islamic aggression' was razed, his movement also had come to an end. His party's seats were going down in UP and it needed allies across the country. Thus, the BJP had to project a pseudo-moderate Atal Bihari Vajpayee. Anti-Sikh riots occurred in 1984 and are still an issue, so there is no reason why December 6, 1992 should not be an issue. However, the fact is that the 'demolition' and the riots across the country including in Mumbai, Surat, Bhopal and other cities, are no longer an issue. There is no question of any rebuilding of the mosque. 6. Successive Congress governments in Maharashtra have failed to act on Justice Sri Krishna Commission report that indicted police officials and Shive Sena leaders for riots. In fact, raking up the 'Babri Masjid demolition' has become just a tool to settle scores or attempt to consolidate votes. Meanwhile, it's Honourable Justice (retired) Liberhan who has the last laugh. The one-man commission has got 48 extensions and has established a record of sorts, spending nearly Rs 10 crore (the money of Indian taxpayer). And even if the report is ever made public in future, with all surety it will be politicised. The parties blamed in it, are likely to reject it outrightly, while others might hail it. In less than two weeks, all the phases of elections will be over and the process of formation of the next government will set off. Once again everything will be forgotten.